Every year of my childhood, my family drove from Joplin, Missouri to Denver, Colorado to stay with my grandparents on my mom’s side. We saw the plains and highways of Kansas on those trips. We also drove yearly to see relatives in Nebraska. The endless miles of monotonous farmland got me down. And don’t get me started on the twisty, hilly seven-hour-multiple-times-a-year trek to DeQueen, AR to see my dad’s family. Our childhood years were also sprinkled with car rides to Louisiana, Oklahoma, Iowa, Texas, Alabama, and Michigan. I’m getting carsick just thinking about it. A Midwest family of four living off teachers’ salaries doesn’t really get to travel by airplane very often. So we saw the world from the jump-seats of pick-up trucks pulling horse trailers, the backseat of Buick’s, and our dad’s beloved hearse of a black Lincoln town car. Our good behavior was rewarded with Sixlets candy and M&M’s from truck stops, butterscotch and cinnamon candies from our mother’s purse, and packed-from-home fried bologna sandwiches eaten in roadside rest stops. My sister Jules and I became collectors on these trips. She gathered up souvenir spoons from every state we entered and I was after state map postcards. As adults, these items are still part of our quest. Are there things from your childhood that bring you joy in adulthood? With two bus and truck national tours behind me before I left musical theatre, as well as lots of independent travel between the both of us, I need Oregon and Jules needs South Carolina and we will both have completed the great 48! I’ve one-upped her, having been to Hawaii, and we both are missing Alaska. How many states have you visited? Other than our collections, I remember one of our favorite parts of the trips was crossing state lines and being greeted by the big Welcome To _______! signs. It felt patriotic to my little girl self, forging the territory of a new state. I would look out the window and hum America The Beautiful to myself as the actual amber waves of grain would whiz by. And my favorite favorite was coming upon the literal purple shadows of the majestic Rocky Mountains in Colorado. It meant that we would soon be eating chocolate chip cookies and graham crackers from our Grandmother’s cookie jar after our long car trip! I am mildly claustrophobic and prone to motion sickness in many situations - probably because of all the road trips of my youth, so a window seat is rarely my choice on an airplane, train, or a bus. My mind feels calm, I can look straight ahead, and the aisle is my best friend offering me an easy escape route to the bathroom. On my journey home from California to New York City a few weeks ago, I was upgraded to first class by the good people at Alaska Airlines! Of course the only seat available was a window, but anyone who has flown this route knows any first class seat is a gift, so I settled in. I was treated like a queen, I was incredibly comfortable, and eternally grateful. My seat mate, whom I should have switched with before we ever took off, continually leaned over me, craning his neck with his iPhone to capture the window views. Well, he was on to something. There’s quite a topography quilt that the earth showcases for the cross country flyers in the friendly skies. From up above, the visions are beautiful! 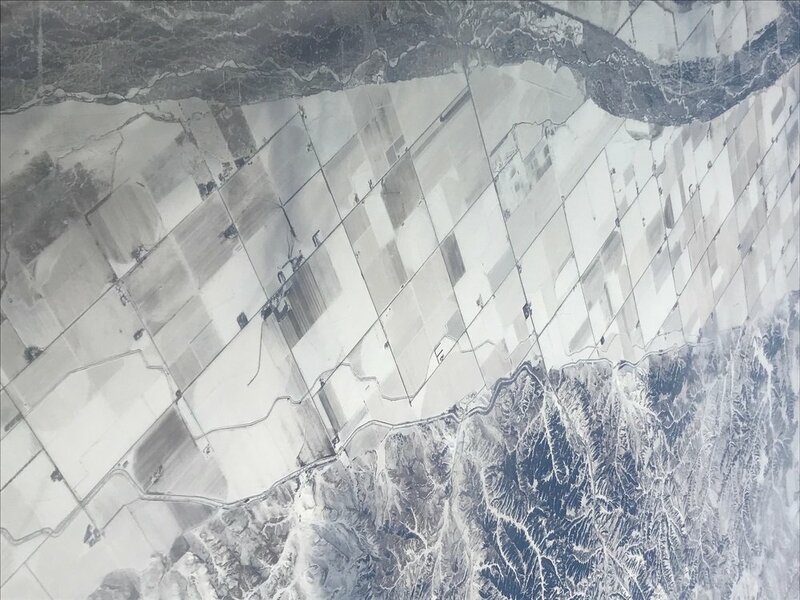 The Sierra Nevada’s in California put on an incredible snow show. We flew over what could have been a frozen Great Salt Lake in Utah, or maybe we’d already hit Colorado and it was Lake Meade. And then more hills and valleys creating gorgeous Victorian tapestry wallpaper patterns on the icy ground. Flying over these states instead of driving through them obviously gave me a different perspective. Those boring plains and fields as a little girl took on new meaning as I flew over them as a grown woman. I watched as the crop circles and plots of farmland went in and out of snowy ground cover. Those fields looked like a big Tetris game of puzzle pieces. The ‘fruited plain’ is truly mesmerizing. I thought about the farmers and their families rising with the sun to grow things for us to consume far away in the Big Apple. I sent them blessings and virtual cups of hot cocoa to get through the rest of (what appears to be from up above,) a bitter cold winter. Now on the ground weeks later, I think about the flooding in Nebraska and the unthinkable suffering of farmers and their animals. May it dry up quickly and may health and prosperity be restored to those communities. And then my sky views changed. The ground was swallowed up by clouds and they came in ocean waves over Pennsylvania. Literal dunes of cotton candy. It was almost like there were cloud tides ebbing and flowing. Or some crazy off road vehicles making tracks through the white plumes. Then the sun began to set over the wing, saying goodnight by kissing the clouds with a sweet glaze of pink and orange. As we taxied for about 30 minutes waiting for our gate to become available I sent little prayers of gratitude for my parents. We weren’t rich, but they showed their little girls the world within their means and planted seeds of wanderlust in them. I sent prayers of gratitude to my sister for sharing these adventures with me as a little kid and that we are close and share adventures as big kids now. Gratitude that I have the freedom and abundance to fly whenever and wherever I want to go. Gratitude for God shedding his grace on me, on all of us. Gratitude that my good, my sweet world of All Good Things, is crowned with brotherhood - generous love and support from all of you. We are all so very, very blessed. The recipe this week is a fried bologna sandwich paying homage to the packed lunches from road trips of long ago. I made it into a Fried BLT. Did you grow up on fried bologna sandwiches? There’s a trick to getting the circle of meat to stay flat in the pan instead of ballooning up like a flying saucer - which was also a cool thing to do - slice notches all around like a pinwheel. Toasted bread, slathered with mayonnaise, lettuce, tomato, and fried bologna, instead of the normal B - bacon..